Baby Walkers have always been a popular way to encourage a child to walk comfortable and confidently at as young an age as possible. They accelerate the young offspring’s development, and have for that reason received quite a bit of criticism, but their effectiveness is not up for debate. If you think a walker might be a good idea for your child, why not go for one of the best? We have compiled a Top 10 list of the currently available best baby walker to make the buying decision easier. Why not go and check it out? This list is revised frequently to keep audience updated. Last, this page was edited on 23 Feb, 2019. Here is the in-depth review of top-rated baby walkers. 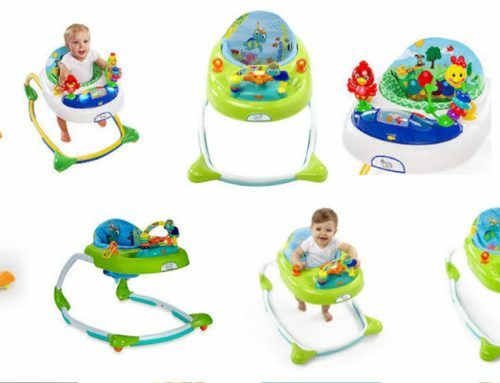 Vtech has been a go to favorite of many parents for many years now, and it’s no wonder they’ve managed to get a spot on our list with their excellent Sit-to-Stand walker. 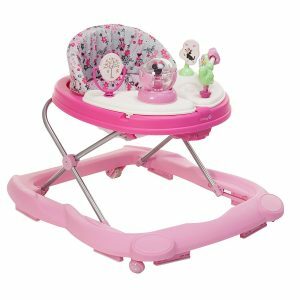 As the name implies, the toy can be used either lying down flat on the floor or propped up as a proper four-wheeled walker with a nice and large detachable handle grip. The toy includes numerous playful activities for your child to pass the time with, such as a detachable toy phone and some sound-making, rhythm-based games. Of course, these do need electricity to work, which makes it a great convenience that some AA batteries come included with the Sit-to-Stand. What we found so great about the Sit-to-Stand, particularly in comparison with other walkers, is the way it drives. The tension of the wheels is fully adjustable across multiple presets. This means you can compensate for how confident your child feels walking. It is done by selecting a setting that is more appropriate for them at any given moment instead of being forced to use the walker as-is. 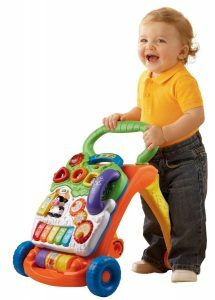 All in all, the VTech Sit-to-Stand Learning Walker is a great option for those looking for a walker that is not only efficient at being just that, but can also fill the role of a fun, toddler-friendly toy. 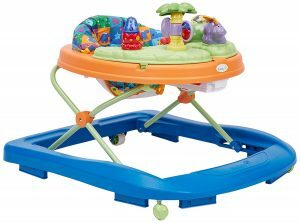 A similar concept in theory to the VTech walker above, the Tiny Steps 2-in-1 Activity Walker by Kolcraft can also be used in two discrete ways. Both as a walker and as what Kolcraft calls a ‘Seated Activity Walker’, simply a stationary version with the same basic features. We think the Activity Walker works well in both modes, though perhaps the shape is more optimized for stationary operation. Like the similar model by VTech, the Kolcraft walker offers a few activities and games, but we find they are far fewer in number and generally offer less replay value. On the other hand, they also don’t require any electricity, which means the Kolcraft walker neither ships with batteries, nor does it need any. Another one of its practical features: The Activity Walker can be folded down completely into an easily transportable form factor. Neat! 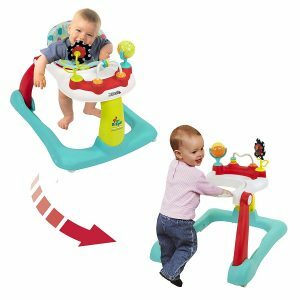 All in all, the Kolcraft Tiny Steps 2-in-1 Activity Walker represents great value thanks to the two ways in which it can be used. Perhaps it comes off as a little similar to one particular model of VTech walker, but as a product of its own, there’s barely anything to criticize. A simpler solution than most, that is the Disney-branded Minnie Music and Lights Walker. It forgoes any sort of fancy 2-in-1 mechanic for an easy-to-understand, hard-to-break construction that can be used both in stationary form, with the wheels removed, and as a normal walker. There are some games and activities to play with, like a song-playing snow globe which, surprisingly doesn’t require any batteries. It pains us to imagine what it would be like if it did, though, since this attachment happens to be an almost universal hit among almost all toddlers who tried it. Expect it to get used quite often. Furthermore, a seat is integrated into the walker itself. This is a nice courtesy and makes using it in a fixed place easier, healthier and more comfortable for the child. And, to top it all off, the Minnie Music and Lights Walker does also fold down. This feature makes it great in terms of practicality. A true all-rounder, powered by a simple design. What more could you want? Definitely recommended. The ‘Around We Go’ by Bright Starts might have some trouble with being classified as a true walker by some, but it is a great product on its own nonetheless. 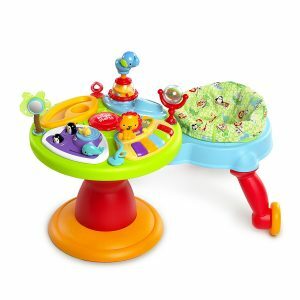 The concept goes like this: The toy is made of two circular pieces, one filled with all the activities and games you’d expect from a high-quality walker. Music-making, listening, puzzles, they’re all there. This piece sits on the floor via a thick, albeit light plastic base and can’t be moved without some effort. The second piece is smaller, sits on a wheeled based and incorporates a chair. The idea is to let your little one sit in the latter. As they try out all the games, they’ll essentially have to orbit the centerpiece containing them, encouraging them to walk. The obvious advantage to this design is, of course, the fact that it barely needs any free space, whereas a normal walker strictly does. It’s unconventional, but we like it. It definitely does get young toddlers to walk just like a regularly-styled walker would; this one just happens to be a little unique. If you want something to stand out from the pack, then, the ‘Around We Go’ 3-in-1 Activity Center may be your best option. The Sounds ‘n Lights Discovery Walker is mostly standard fare, but it does feature a few unique ideas. For example, the built-in games and toys, apart from being very well-made considering the sub-$50 price point, fold outwards, allowing them to be used to the child’s front or sides. More importantly, using them swept away to the side reveals a tray that can be used for play or used to hold small snacks. The sturdy frame folds together as well, but unfortunately, only downwards; the walker doesn’t actually get smaller, just loses its height. Thus, it might be more accurate to say it ‘retracts’. The wheels on the Sounds ‘n Lights are some of the best we’ve seen on a walker of this type. They manage to get it moving even through rather thick carpeting. And the ride always feels smooth and comfortable enough. To make a long story short, the Sounds ‘n Lights Walker is a basic, but very well-made and well-performing walker with some interesting and smartly thought-out features to back it all up. If quality is your main concern, go for this one. Wrapping it up, which of our Top 5 best baby walker do you think is best? For different needs and different people, there are always different products. And in fact, perhaps your ‘perfect one’ isn’t even on our roundup. That’s not too bad, though. Now, you have some understanding of what constitutes a good product in this market and what to look out for. You can easily make an educated decision of your own! In any case, we wish you the best of luck with your purchase.